Bulges in ceilings are typically caused by either of two things: improper installation of the ceiling materials or water leaks. Not only are they unsightly, ceiling bulges can also pose a hazard, particularly if the bulging material has forced the fasteners to loosen from the joists. Bulging ceilings can be repaired, but you must identify and correct the cause of the problem first. Water leaks cause irregular bulging. Ceilings made using plaster applied over gypsum lath may develop what is called a shadow or bulge effect if the final coat of plaster is applied before the first coat is fully dry. The moisture from the first coat moves back into the lath and results in bulges at the seams, or every 16 inches in one direction. In some cases, the seams running perpendicular to these also bulge. In other types of ceilings, such drywall, too much weight from insulation, exposure to prolonged humidity, an improperly installed vapor barrier, or the installation of ceiling panels that are too thin for the frame spacing can cause ceilings to bulge. Bulges in ceilings caused by improper construction may sometimes be repaired by removing the material in the bulging areas and replacing with another layer of board or plaster. If there are numerous bulges, you may have to replace the entire ceiling to correct the problem. To prevent new ceilings from bulging, allow coatings of plaster or joint compound to completely dry between applications, and do not overfill the cavity above the ceiling with insulation. If humidity is a problem in your home, install a dehumidifier to remove excess moisture. Leaking water from plumbing pipes or exterior walls can enter the ceiling for long periods before the ceiling material begins to bulge, so they go unnoticed until significant damage is already done. 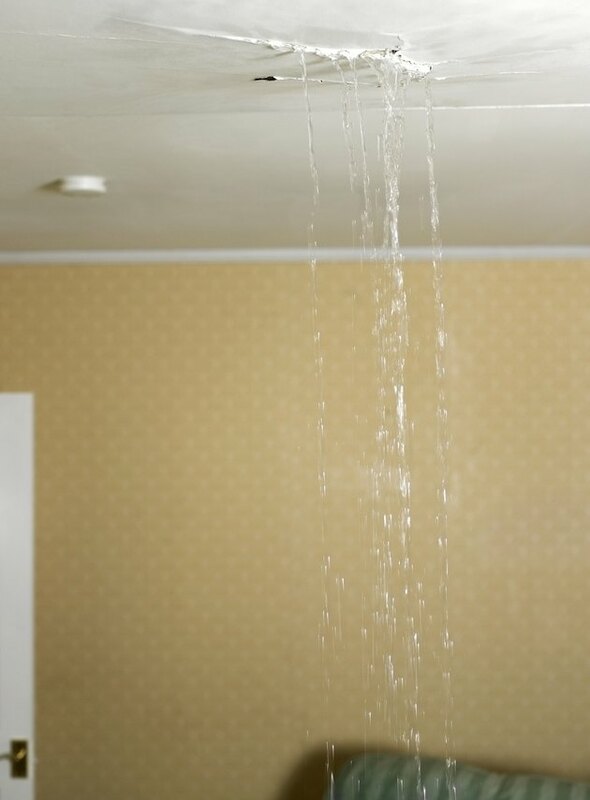 If your ceiling is bulging due to a leak, the structural integrity may be at risk. Look for depressions around the fasteners, or small dimples surrounding nails or screws. If you find these depressions, move all furniture out of the room as a precaution and call a professional to inspect the ceiling. A bubble or droop in drywall ceilings indicates that water is pooling in the ceiling, and this usually means the leak has not been resolved. Water-damaged ceilings are often repairable, but the source of the water must be addressed before you begin any repairs. If you cannot find the source, contact a plumber to identify whether or not the leak is in your pipes and have the problem fixed. Water can travel for long distances, so the location of the bulge may be far away from the source of the leak. Once the leak has been fixed, you can repair the damaged ceiling. Hold a bucket beneath the bulged section of ceiling and puncture the bulge to release any water pooling behind it. 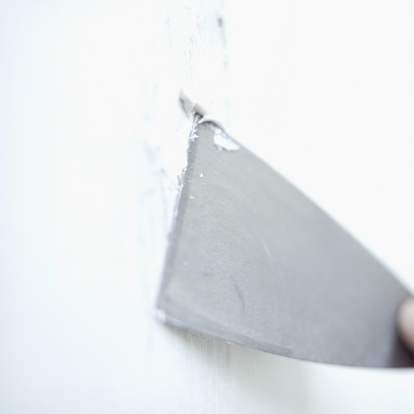 Cut away the damaged section with a sharp knife or a reciprocating saw to minimize mold and mildew growth. Cut the material back until you reach the center of the ceiling joists within the dry sections of ceiling. If the joists are still wet, let them dry completely before you replace the damaged section of ceiling. If you have a suspended or tiled ceiling, simply remove and replace the damaged tiles after repairing the source of the leak.